New races, spells, feats, class archetypes, and monsters, all with a clockwork theme. A review copy of “Construct Compendium” was provided for the purposes of this review. While Dungeons & Dragons has always been firmly rooted in a fantasy setting, even the lowest of magic settings often include golems and rudimentary mechanical devices, like crossbows and spike traps. The “Construct Compendium” provides a large amount of mechanical-related content. Over 70 pages provide new races, class archetypes, feats, spells, monsters, and a few magic items, all tied together with the theme of constructs. The guide is organized and divided into chapters similarly to official D&D supplements like Xanathar’s Guide to Everything. The first chapter covers the four new construct-themed races. Warforged should be instantly familiar to fans of Eberron. Here they’re given two ‘subraces’ that let you pursue a more DEX-based build instead of STR. The cyborg-like Ascended would be more at home in a Shadowrun setting. They seem particularly powerful compared to the base-line classes, since you can become an Ascended of any of the standard races. Kemlings are weird patchwork Frankenstein monsters who are artificially created through alchemy. A bit creepy. They have the ability to increase one of their stats by 1 by performing a ritual. The Rogue Modron is definitely the most interesting. You begin as the lowest form of Modron, then change forms as you level up, gaining new abilities. 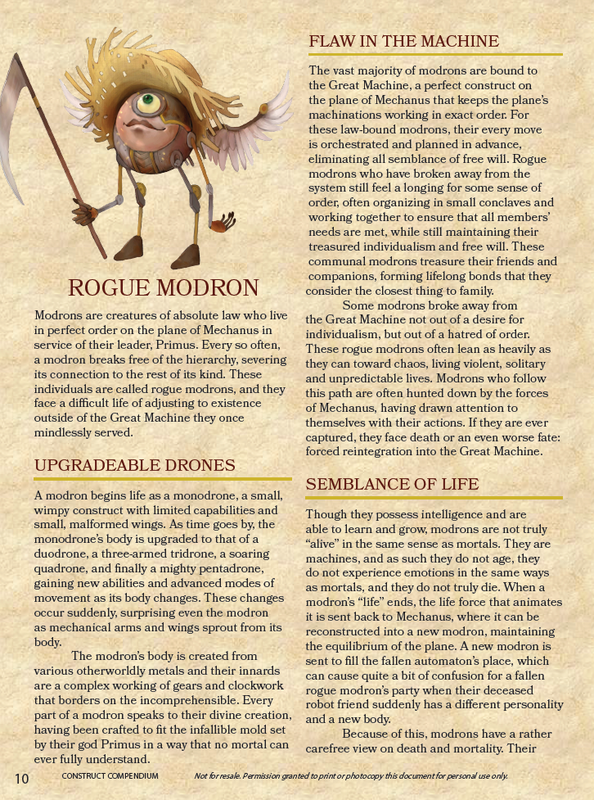 Oh, and you also can’t technically die: a new modron will take your place, with the caveat that the new modron is one level lower and has a completely new personalities and none of the same memories! Chapter 2 adds a new class archetype for each of the 12 classes. Like the races it’s difficult to judge the balance level of each new archetype, but some fit the mechanical theme better than others. The fighter Bladespeaker gets a Dancing Sword familiar that becomes sentient – nifty! With the Path of the Scarecrow a barbarian can mediate and turn into a piece of furniture or other innocuous object to surprise foes – weird! The druid Circle of the Warshaper essentially turns the druid into a T-1000 with sword arms – what!? Chapter 3 contains only a single page of feats. Given the staggering amount of content everywhere else, it feels a bit bare. Getting Augmented Eyes to gain Darkvision and see invisible creatures and WIS +1 is going to make everyone line up to get their eyes replaced, Minority Report-style. Chapter 4’s spells are referenced throughout many of the new archetypes, such as the Cleric’s new Construct Domain. I was impressed with the variety and diversity of spells, despite sticking to a single theme. Summoned dummies can both attract foes and frighten them. Objects can be animated to become steeds – go go couch-horse! Transform an ally into a living statue, summon a flying drone, er, ornithopter, and assume control of any construct. Several new magic items are provided in Chapter 5. My favorite are the Boots of Hurtling, which turns your character into Iron Man. However, you have to roll a d20 every round. You have a 50% chance to fly to the nearest creature and make an attack, but there’s a chance the boots will vent a fog of steam around you, or even blast you in a random direction. I love items that provide a fun balance of risk and reward. Chapter 6 is the bestiary, and it’s the largest section of the compendium, taking up nearly half the total length. 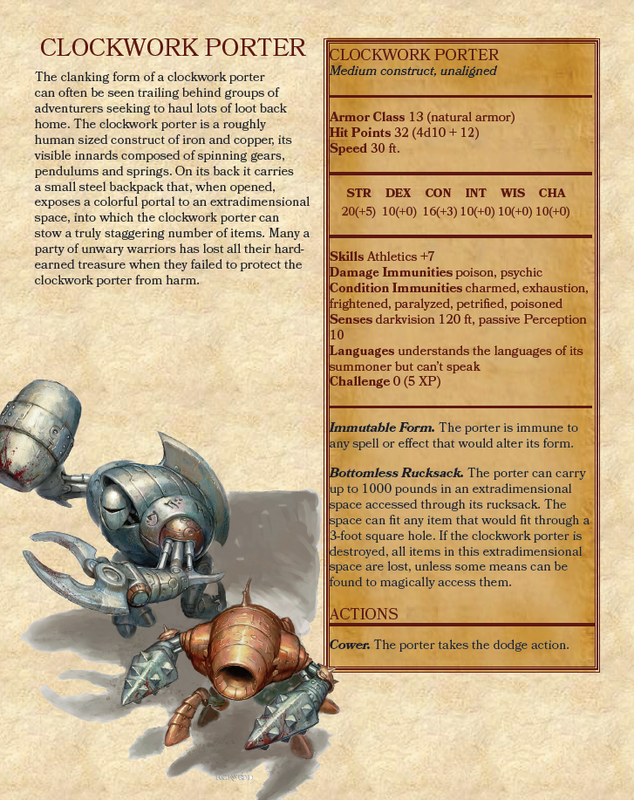 Full stat blocks and descriptions are provided for every golem-type creature you could imagine, including several new animated objects, vehicles, and a race of lawful constructs from the Planet of Mechanus called Inevitables. The final chapter includes a guide to creating your own golem. The rules are detailed and expansive, including using different materials, scaling for size, and imbuing them with several pages worth of optional attacks, all drawn from other monsters and abilities. This is very high level stuff, as it requires a substantial money, time, and spellcasting investment. As it should, as most of these golems are crazy powerful, essentially letting a player create a second PC. It feels way too powerful. 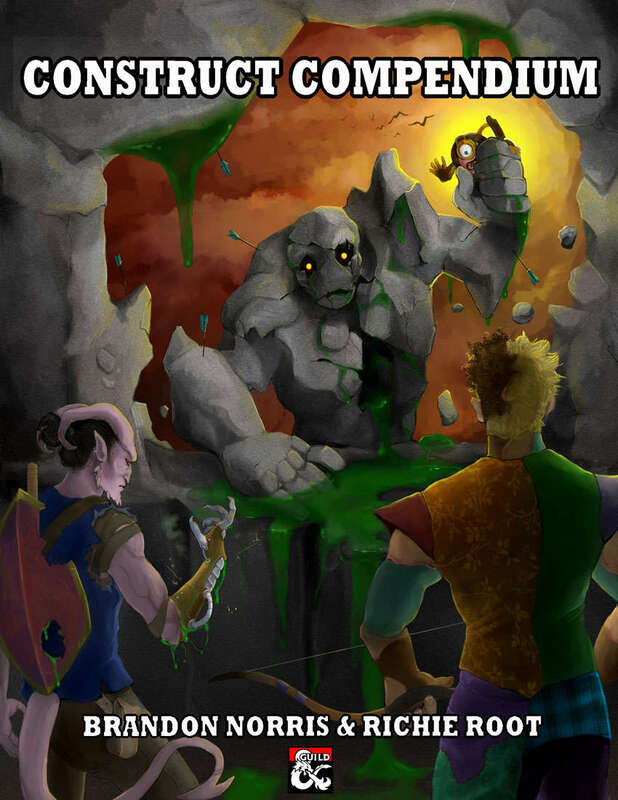 The only way I would allow this in my campaign would be if the entire party pooled their efforts together, and the golem was ultimately controlled by the DM. Or better yet, let them find an NPC golem and let the players add some of these nifty effects from monsters they’ve slain. Over 75 pages of content, all designed around a single theme. The new races are a lot of fun, and given lots of details and lore. Nice variety of new spells, from healing to crowd control and summons. The Verdict: The “Construct Compendium” is incredibly comprehensive, with a nice mix of everything you could want to inject some mechanically-themed elements into your adventure.